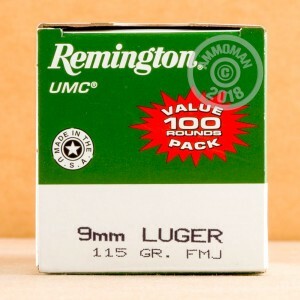 This 9mm Luger ammunition from Remington UMC is an affordable practice load for a wide variety of pistols. 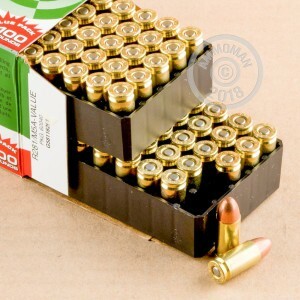 Each cartridge in this 100-round value pack fires a 115 grain full metal jacket ("metal case") bullet at a muzzle velocity of 1,145 feet per second. This is a standard pressure 9mm Parabellum load ideal for compact carry pistols like the SIG P938, Glock 43, Springfield XDs, and Kahr CW9. Remington UMC ammo is loaded in Lonoke, Arkansas using non-corrosive Boxer primers and brass cases. Grab a few of these packs and save on your next range trip. All orders over $99 at AmmoMan.com ship for free!